These days Tsunokami jinja is located on an elevated spot on top of a hill looking out over the sea, which makes its name lit. ‘over the harbor’ shrine a most fitting one. 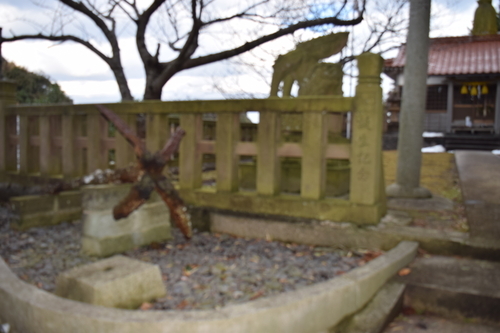 A shrine of this name can also be found in Kashima town in Tayu ura. In terms of the development of the name, Tsunokami can also be written using characters which read as ‘gods of the harbor’. The Shimane-gun (district) entry on Nonami bay from the 1717 publication, the Unyoshi describes Nonami as having the shrine ‘Tsunokami Myojin’. The ‘kami’ part of the name is written with yet another character this time meaning ‘protect’, but all three names can be read as ‘tsugami’. The mystery is which of these names this shrine originally received. The two deities of this shrine don’t appear in with the Nihonshoki or the Kojiki historical records of Japan, although they can be seen in the ‘Oharae no Norito’, the Shinto prayer for purification that is mentioned in the Heian Period book of laws, customs, and Shinto regulations, the Engishiki. From the kami name Oseritsu, it can be surmised that it is a god related to water. The origin of this god tells of a kami that sat in the rapids of a river washing away impurities into the ‘great wide open sea’ , a phrase that ties in with the location name Ōmi (great sea). Based on this, the location name of this shrine is very apt since it means that the kami of the port is watching over the Okidome harbor. According to the shrine history, just like in Tako-ura, during the Genroku Era (1688-1704), the Tsuwano clan established the shrine through the ceremonial transfer of a tutelary deity. Of great interest is the male deity Seoritsuhiko no kami, a name that does not appear in the Engishiki. It seems to have been a kami ‘born’ in the Okidome area. Coming from Konami Beach and heading towards the hilly area, you’ll see a large sign on your left advertising the Marine Park Tako Cape. As you approach the port and head down, Tsunokami jinja will be in the hillside on the right of the valley. It’s surprising to learn that this shrine, as well as Hachimangu in Tako bay was established during a ceremonial transfer by Tako Geki Saemon of the Tsuwano Clan. The parading through the town of a model representing the god (kami) Toshitoku sama is also an Okidome port ceremonial event. 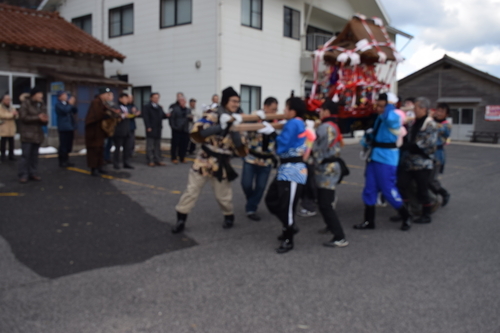 In the same way as other locations, the adults provide support and guidance by shouting out “Motto mawase” to the youngsters bearing the o-mikoshi (portable shrine) encouraging them to keep it aloft, a long passed down religious ritual. 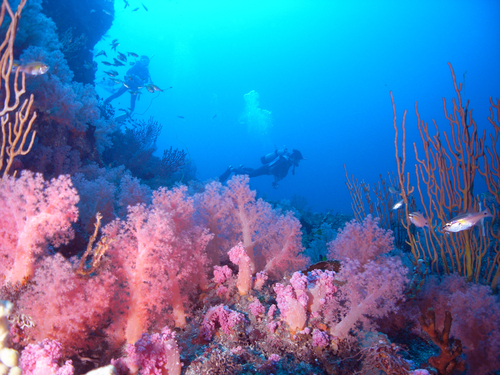 At the port where this takes place is a (currently closed) scuba diving school where pink coral can be seen. At the entrance to the town there is a parking lot and toilets and taking the byroad will lead to a small cave called the ‘Shiokaki hole’. When entering the 49 day period of mourning after the passing of close relative, sea water is traditionally scooped up here, but recently due to road works, this isn’t so easy to access and families have been performing Shiokumi (collection of sea water in bamboo pipes) at other bays in the area instead. 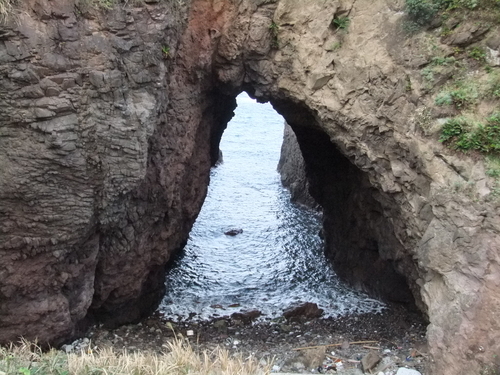 Legend has it that warrior monk Musashi Benkei, said to have been born and raised in Nagami cho in Matsue city, collected sea water from this cave himself while on the 42 bay pilgrimage in an attempt to cure an eye ailment. It’s said that following his offering of seawater from the cave, he was able to recover from his affliction. 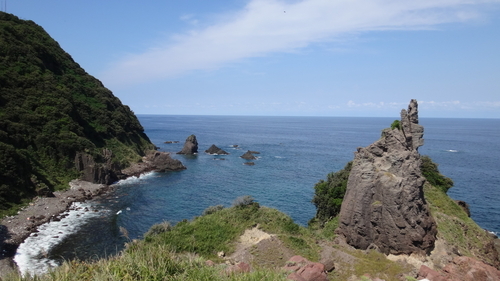 In addition, in the south east coast of Okidome, there is an area known as the ‘Seven Holes of Tako’ containing a cave called “Makuragiana’. This is related to Kezoji Temple of Mt. Makuragi. According to legend, togijiru, the water used to wash rice at Kezoji flows at this cave. Around 80 years ago, four youths set out to sea to investigate Makuragiana cave but at around 30 meters, they were in total darkness, they carried on, but 80m in, they came to a dead end. One can only wonder about the mental state of the boys as they made their way through that ghostly scenario. The late Mr. Ono Keijiro, a resident of Sezaki in Shimane left behind his notes on this expedition hesitating to fully attribute a logical explanation for such a mysterious place. The historical records for Kezoji temple also mention fishing boats relying on the light coming from Mt. Makuragi as guidance expressing the close connection between shrines, temples and the Sea of Japan back during the peak marine transportation period.